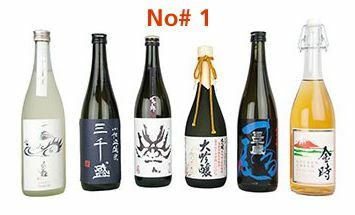 The Ichiban (meaning number one in Japanese) Sake Selection brings all of our top quality sake into one case. This selection represents the pinnacle of the brewers’ craft: complex and layered Daiginjos and a delicately aged Koshu. Snowy Peak – A limited edition, limited run Junmai Daiginjo from Kimura Shuzo. Think: luscious with great balance between flavour & aroma. Rare Brew – a delicate and dry Junmai Daiginjo from Michisakari. Think: clear, dry, refreshing. Black Face – a dry and very drinkable Junami Daiginjo from Hayashi Honten. Think: light, refreshing & clean-tasting. Hidden Glade – A Trophy winning Daiginjo from Kimura Shuzo. Think: Bright, aromatic & expressive. Tatenokawa 18 “EIGHTEEN” – ultra premium Junmai Daiginjo from Tatenokawa. Think: Ultra premium. Superbly balanced tropical fruits. The Ichiban Sake Selection is one to wow your friends or simply to explore the upper echelons of sake making. It also makes a wonderful and generous gift. Allergens: Hidden Glade and Golden Amber may contain gluten.